Persia became a powerful empire under Cyrus the Great between 600 and 529 BC. In 546 BC it captured Sardis in Lydia which was the home of King Croesus and the first ever coins. Following this capture Persia started to produce it own coins, probably minting them in Sardis. When Darius I came to the throne in 521 BC, he issued gold coins which became famous as "Darics" or archers. The obverse design of these showed the king in a running kneeling position holding a spear and a bow. In 330 BC, Darius was captured by Alexander the Great of Macedon, and the great days of the Persian Empire ended. Since then Persia has had a chequered history being conquered by Assyrians, Medes, Macedonians, Seljuks, Turks and Mongols, but has retained much of its own character. Persia converted from an absolute monarchy to a constitutional monarchy in 1906. In 1921, Reza Khan took power in a bloodless coup, and in 1925 caused himself to be elected as Shah. His son Shahpur Mohammed Reza following him in 1926. In 1931 the Kingdom of Persia changed its name to the Kingdom of Iran, and in 1979, the monarchy was overthrown and Persia became the Islamic Republic of Iran. The gold Darics, first issued by Darius I between 521 and 485 BC, became famous in the ancient world. Their issue was continued by Xerxes and Ataxerxes. Like many ancient coins from around the Mediterranean, they are to be found listed as Greek coins. The Mongols introduced a system of coinage in 1279 which was still in use until 1878. The coins of this period are typical of medieval Islamic coins, and have hardly been studied or collected. 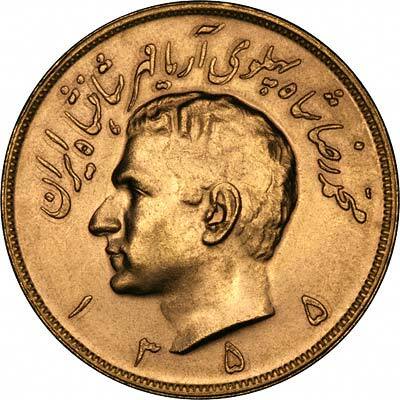 The denominations used for Persian coins include shahi, dinars, rupees, tomans, abbasi, riyals, krans or qirans, ashrafi, mohurs, from 1930 pahlavis, and for the republic, azadis. Because of the use of the Persian script on all Persian coins, most western coin collectors ignore Persian gold coins. They are not easy to identify. This means that any collectors of Persian coins should be able to find many relatively cheap Persian coins, which may include rare and potentially valuable items, provided he is prepared to more research than the average collector. As Persian coins are not within our main areas of specialisation, any of our cataloguing of Persian gold coins may be in error. 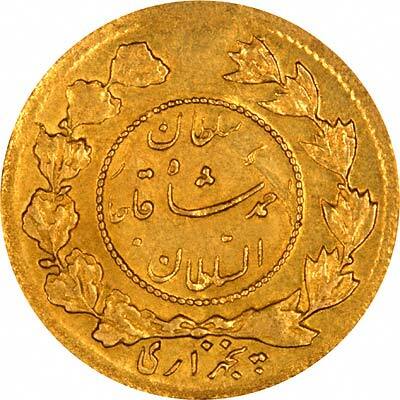 It also means that most of our Persian gold coins will be offered by type, and will be quite reasonably priced. 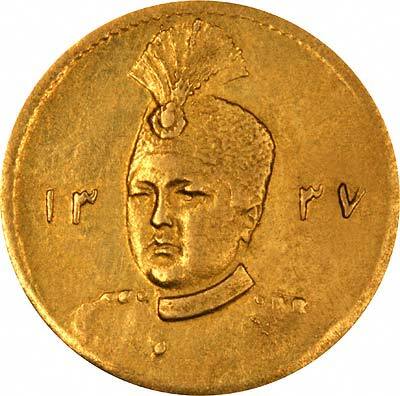 We give brief specifications for some of the most recent and commonly encountered Persian gold coins, followed by a stocklist of any Persian gold coins we have for sale. Persia, as most muslim countries, used the moslem lunar calendar until March 25th 1925, when it switched to a solar one. From 1976 to 1978, it changed to a monarchial calendar system, before reverting to the previous solar one. The calendar changes can cause some confusion, particularly the monarchial years, which apparently jump by about 1,200 years, which would place them in the 32nd century AD if they followed the previous system. 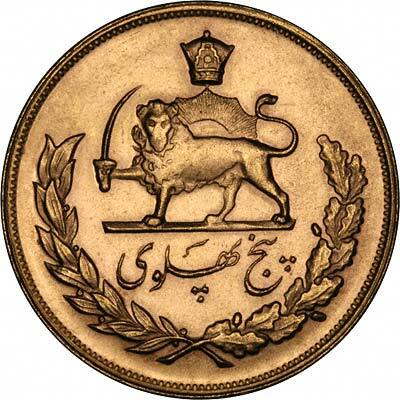 Technical specifications of the most frequently encountered Persian gold coins. We make an active market in almost all coins, including Persian and Iranian coins. If you have any of these coins to sell, please contact us, or post them to us for appraisal and offer. For Persian coins in silver or base metal, or Persian coin sets other than gold, please look at the Persian Coins page of our original website.